And now a book to keep you occupied, but not too distracted, as you wait for things to cook. Since we already referenced Louise Penny in this post, we are reviewing her latest as this post’s fiction pick. How the Light Gets In by Louise, Penny (August 2013) – In this outing, Ms. Penny ties up (in very satisfying ways) most of the loose and lingering ends from the past four or five Gamache mysteries. We think this is one of the best books in her series, and look forward to seeing where this series goes now that so many characters are ready to move on from their past misdeeds. Great post L and L You just have to love soups. Thanks for the tip Sally. 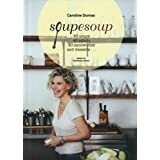 We are trying to figure out a way to get the Soupesoup book into independent booksellers. In the meantime, ask your favorite Canadian to send it to you :)!